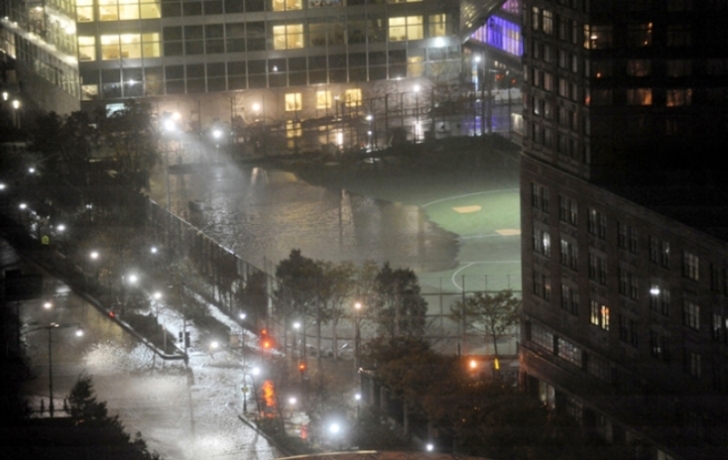 Six years after Superstorm Sandy ravaged the Battery Park City ball fields and the Asphalt Green community center next door, the Battery Park City Authority is on a mission to save those heavily used recreational facilities from the next crippling flood. “We’re looking at the perimeter of that whole site and figuring out various options as far as what needs protection, and how,” said Karen Robison, STV’s manager for the ball field project. The firm said the design would likely feature a combination of permanent walls that could be raised to their full height in advance of a storm surge along with lower and lighter deployable barriers that would be installed only when needed. “The problem with the self deploying [wall] that we’re looking at is that it takes up more land area,” Cerino added. The reason, he said, is the soft landfill where it will be installed. “You’re not in great soil so resisting 10 feet of water is very challenging,” he said. A higher wall would probably be needed along the West Street side of the field, the lowest level of the site and the point where water gushed onto the fields and into the lower floors of the community center during Superstorm Sandy. Deployable barriers may be used at higher elevations, such as the entrances to the fields on Warren and Murray Streets. Uppermost in the minds of many at the meeting was the disruption to Downtown’s baseball, soccer and football leagues during the construction. Bill Bialosky, commissioner of the Downtown Soccer League, worried that resiliency work on the two other fields used by local kids, Pier 40 and East River Park, will be underway at the same time. “You’re talking about a [construction] start date of October, 2019, which would be right dead center in our season,” said the soccer league’s vice president, Eileen Montague. “I have to admit selfishly that part of the reason I want to see this project happen is I don’t ever want to go through again what I went through with the field after Sandy,” Dawson said. According to STV, the contractor, the design is expected to be completed, and construction to begin, next fall, with work completed by the end of 2020. The community will continue to be consulted throughout the process, they said.